Stir oil into the mayo and then add all the other spices. Mince celery, scallion, and green onion until very fine. Stir veggies into the sauce base. Feel free to adjust seasoning to your liking. Serve sauce with any fried fish or fries. It's also great on sandwiches! Store extra sauce in the fridge. It'll keep for at least a week. It’s very likely this post will get me in serious trouble. I’ve never lived in Louisiana (or France) so it can sometimes be hard to sell myself as someone who knows about Creole and Cajun cooking. But here it goes anyway! People toss around Creole and Cajun cooking interchangeably, but they actually do mean slightly different things. They have a lot in common, but in my mind Cajun food tends to be a bit more rustic while Creole foods tend to be a bit more European. A Cajun dish might toss a bunch of spices in a pot of rice and call it good while a Creole dish might take those same spices and make a sauce out of them. Same idea, different application. 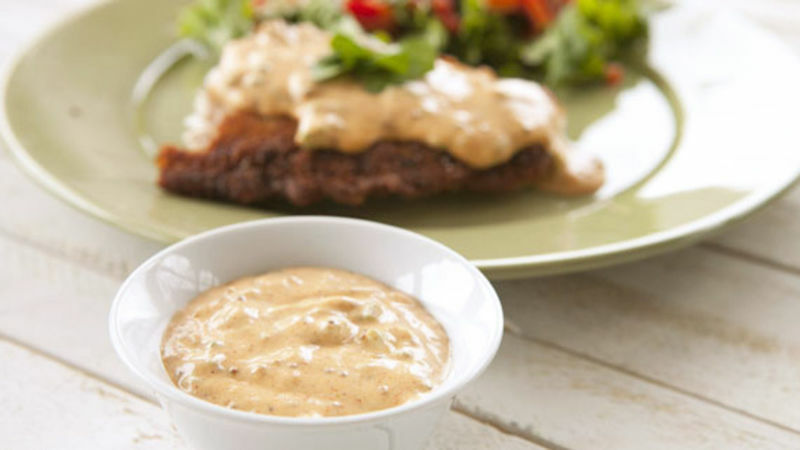 The remoulade sauce is a classic French sauce that has been adapted in many Creole dishes. If anybody tells you they have the only real remoulade recipe, they are certainly lying. There are probably as many remoulade recipes as there are cooks in Louisiana! I won’t even kid you and say that my version is the only way or even the best way. But I will say that my remoulade takes about 10 minutes to make and it’s really good. What more do you need to know? This sauce is typically either oil or mayonnaise based, but I actually use a bit of both. I use about a 5-to-1 mayo to oil ratio. In addition to that, you’ll need some good stone ground mustard, horseradish, and a bunch of spices. Let’s take a closer look at the spices. There’s lots of paprika, some cayenne pepper, creole seasoning (or Old Bay in a pinch), garlic powder, kosher salt, and ground pepper. Seriously stir all of this stuff together in a big bowl. If you’re a risk taker, give this sauce a taste at this point. It will be really strong! Not knock your socks off strong – don’t worry, we are going to thin it out a bit with some classic veggies. Specifically, I like to use a spin on a classic mirepoix, which is normally onions, celery, and bell pepper. I just use scallion instead of onion. You want even amounts of each of these veggies, and take your time to mince them pretty finely. Stir these into the sauce and it will lighten significantly. It’ll still be pretty strong on its own at this point, but remember that you’ll be serving it with other stuff. It’s not a soup! When it comes to what to serve this with, you could serve it with almost any seafood under the sun. Check out the seafood recipes on Tablespoon and go crazy. Specifically, the sauce goes great with fried fish. I busted out my cast iron skillet and made a big batch of fried catfish for my sauce! I recommend reading this article on how to fry fish. I just lightly breaded my fish and fried it in some oil for about 7-8 minutes on both sides (my catfish was pretty thick). Then I slathered it with sauce and served it with a salad so I could call it healthy! This really is a great all-purpose sauce. It’s creamy and spicy and can be served with all kinds of good stuff. Get creative with it! Nick wishes he could be in New Orleans for Mardis Gras! Be sure to check out his blog, Macheesmo, and follow him on his Tablespoon Profile.